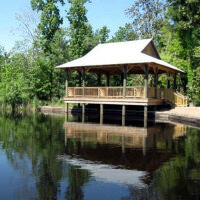 Camp Louisiana had the chance to chat with Marcelle, the Park Manager at Palmetto Island State Park. He shared some insights on the popular activities at the park, their proximity to where Tabasco Pepper Sauce is made and the options for camping at Palmetto Island State Park. I personally like to either bike along the roads and trails or canoe on the canoe trails. I like site 79. It is a double site with lots of shade and it is not too far from the bathrooms. Yet, it is centrally located so that it is easy to visit with other campers. When was Palmetto Island State Park founded? How did it start? Palmetto Island State Park opened in October of 2010. The idea for the park began decades before the park opened. Local citizens decided that a state park was needed in the area. A site was chosen and named. Plans were made to sell it to the state for a minimal price. Eventually the state park was built and opened. What are the most popular activities in the park? From April through September, the splash pad is very active. 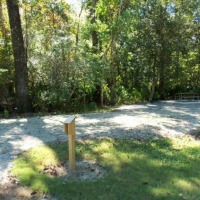 It is located centrally in the park next to the Nature Center and the meeting room. The campground is a favorite place for locals to gather for Halloween and Thanksgiving. Where is Palmetto Island State Park located? What are some other attractions in the area worth checking out? We are located about 10 miles south of Abbeville, La. 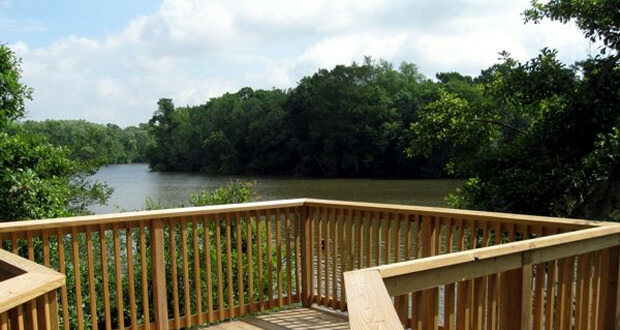 The back part of the park is located along the Vermilion River. 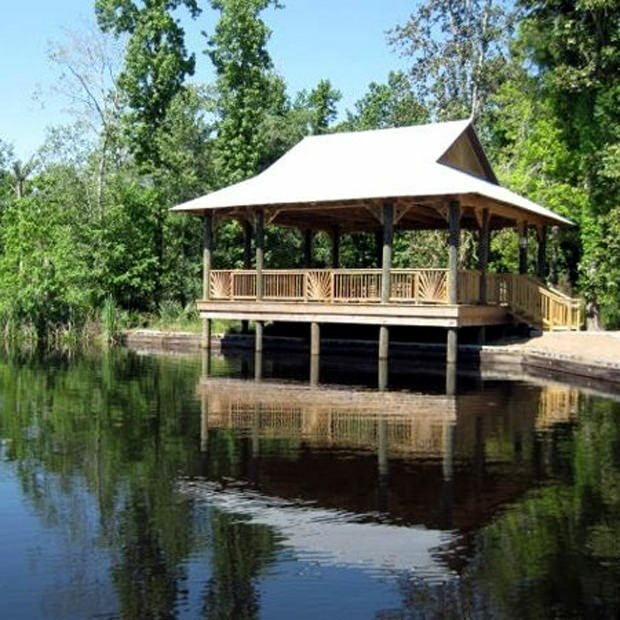 Some other attractions are the Abbeville Cultural and Historical Alliance Center and Art Gallery, Avery Island Jungle Gardens, Acadian Museum of Erath, Sam Guarino Blacksmith Shop and Museum, and the Lafayette Natural History Museum and Planetarium. Which one of the attractions is your favorite? Avery Island Jungle Gardens has wildlife, tropical plants from around the world, and it is where Tabasco Pepper Sauce is made. It is a beautiful place to visit. What are the campsites like within the park? Are they more open or secluded? We have 96 campsites. 20 sites have tent pads that have a sand substrate and are 12’ x 18’ in size. 4 of the sites are ADA accessible, and 4 of the sites are double sites with extra parking for boats or multiple vehicles. The sites are close together but separated by trees and shrubbery. So a lot of them offer privacy. All sites will accommodate large RV’s and they have 20, 30 and 50 amp hook-ups. All sites have lots of shade. They each have a fire pit with a grill on top, a lantern post and a picnic table. 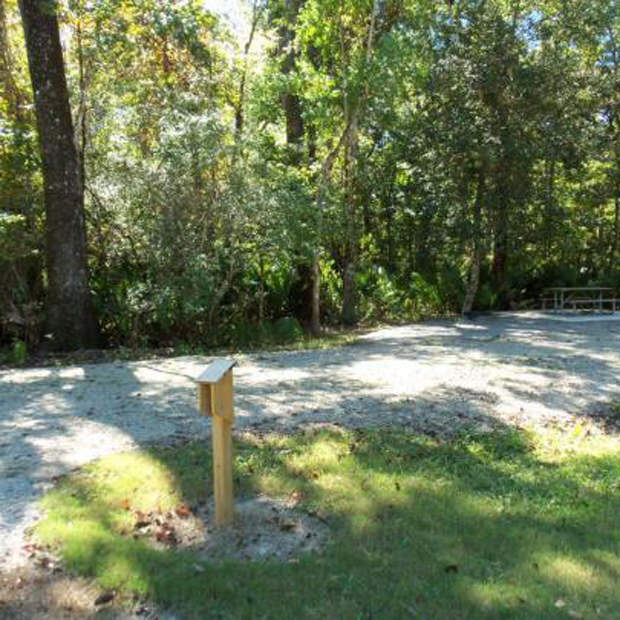 There are many options when camping at Palmetto Island State Park!